Brief Description of the Case: A two-year old Black Angus first-calf range heifer was presented for inability to rise for a one day duration after a stillborn calving and casting in a barn. Upon presentation, she was in sternal recumbency, deep pain negative in both hind limbs, and leaking urine. Acupuncture, electrical stimulation, massage, kinesiology tape, flipping sides, and dexamethasone were used for treatment over a three-day period. Acupuncture points that were utilized included GV-14, BaiHui, BL-23, BL-26, BL-36, BL-39, BL- 40, BL-53, BL-54, GB-29, GB-30, GB-34, GB-39, ST-36, and bafeng. Brief Summary of the Results: The heifer improved dramatically after the second and third treatments. She regained deep pain in both hind limbs and attempted to stand on the third day. Seven days after the last acupuncture treatment, the heifer was standing and able to ambulate. “No Tag”, a two-year old Black Angus first-calf heifer, was presented on 6/13/17 unable to rise after calving the day prior. This heifer calved in a decrepit barn and was cast against the corner during calving. The calf was found dead. She was taken out of the barn before the veterinarian arrived. The heifer was one of approximately 400 head of commercial range cows. She had no previous medical issues and was bred at the same time as her herd-mates by the calving-ease bull. She was current on IBR, BVD Types I and II, PI3, BRSV, Vibrio, five strains of Leptospira species, Leptospira hardjo-bovi, Haemophilus somnus, Moraxella bovis, and anthrax. The owner reported that despite being down, she was eating and drinking well. 6/13/17: On physical examination, the heifer was bright, alert and responsive yet unable to rise with her hind limbs. Due to her nature as a range heifer, she was fractious when approached. She was laying with her left side down in sternal recumbency. Her vital parameters were all within normal limits at 100.5’F, 30 beats per minute heart rate and 32 beats per minute respiratory rate. The heifer’s body condition score was a 4/9. Her rumen was contracting strongly at approximately one contraction per minute. The heifer’s mucous membranes were moist and pink. Her lungs auscultated with apparently normal bronchovesicular sounds and heart auscultated apparently normal. On neurological examination, she had deep and superficial pain in the front limbs. The hind limbs did not respond to either superficial or deep pain tests. Both hind limbs were considerably colder to the touch than the front limbs and were infested with flies. She was leaking urine and also had a small amount of lochia present. No perineal reflex was present. Upon hind limb, pelvis and spinal column palpation, no specific areas of pain were located, no swelling noticed and no fractures were able to be detected. 6/14/17: On day two of treatment, all vital signs were within normal limits. She was bright, alert and responsive. She had been eating, drinking, urinating and defecating appropriately. There was no urine leakage and perineal reflex had returned. The heifer was in sternal recumbency with the left side down. The owners had reported flipping her once so she was able to flip to the other side at some point over the evening. The left hind limb was deep pain negative and cold to the touch. The right hind limb was deep pain positive and warm to the touch. 6/15/17: On the day of the last treatment, the heifer was again, bright, alert and responsive with all vital signs within normal limits. She was found in sternal recumbency with the right side down. Both hind limbs were deep pain positive and no urine was leaking. The heifer had been eating, drinking, urinating and defecating appropriately. She attempted to get up when approached but did not have the strength to stand. In a commercial herd setting, value of the animal is taken into serious consideration. This heifer would most likely bring $900 at auction or the producers could have her butchered locally, of which they chose the latter. Because she would be butchered as soon as she could stand on a trailer, no NSAIDs were given due to the 21-day withdrawal of meloxicam. She was given 0.04mg/kg dexamethasone intravenously as an anti-inflammatory which has a 0-day withdrawal. No other drugs were administered over the three days of treatment. A dry needling with electrical stimulation acupuncture treatment protocol was chosen due to the 0-day withdrawal. The points utilized were selected due to their stimulation of the femoral, sciatic, lumbar spinal, tibial, and common fibular nerves. Massage was used to loosen any restricted fascia around the muscles and increase blood flow to the extremities. Kinesiology tape was also used to allow for better myofascial movement. In cattle that will not make an attempt to rise, it is very difficult to pinpoint the cause of paralysis. Most calving paralysis occurs due to dystocia, although that was not an apparent causative agent in this case. Differentials for paralysis due to being pushed up against the wall in conjunction with calving include obturator nerve injury, peronial nerve injury, sciatic nerve injury and tibial nerve injury. Pelvic fracture(s) could not be ruled out in this case although much less likely. The heifer’s putative diagnosis was acute severe obturator and sciatic nerve injury. Obturator nerve injury occurs commonly due to dystocia and typically affects both hind limbs. Sciatic nerve injury causes a loss of all distal skin sensation. A myofascial examination of the neck and front limbs was difficult to perform due to her fractious nature. No positive myofascial responses were located in the hind limbs. On day one of treatment, GV-14 and BaiHui were placed first to see how she would react using 0.25x40mm Seirin J-type needles. From there, BL-23, BL-26, BL-36, BL-39, BL- 40, BL-53, BL-54, GB-29, GB-30, GB-34, GB-39, ST-36, and bafeng points were placed. Electro-acupuncture was used at 1.5Hz. The second and third treatments included all of the same points along with electro-acupuncture this time using 0.30x40mm Hwato needles. Kinesiology tape was placed along the caudal bladder line. Adjunctive therapies included hip lifting the heifer once per day, massage once per day, and flipping down sides once per day. Therapies had to be tailored to the producer due to the heifer being many miles from the producer’s home and in the middle of a pasture where getting to her was time consuming and difficult. She had to be hand watered and fed as well. Only three treatments were able to be performed to keep the input cost lower than the heifer’s market value. Her prognosis was poor due to the fact that the owners were not hip lifting the heifer. 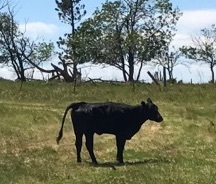 On 6/23/17, ten days after the first treatment and seven days after the last treatment, the producers sent a photo of the heifer standing and able to ambulate. They were very pleased with the outcome and were able to butcher her in a timely manner. Acupuncture was a great option for this heifer due to the need for her to be slaughtered as soon as she could ambulate. Although acupuncture may have not been the sole cause for the heifer’s recovery since only three treatments were performed and standing occurred seven days after treatment, it most certainly aided in regaining both deep and superficial pain in the hind limbs and corrected her neurogenic urinary incontinence. 1. Scott P. Calving Part 3- Nerve Damage. NADIS Animal Health. 2017. 2. Weaver A., Jean G., Steiner A. Bovine Surgery and Lameness. Second Edition. Blackwell Publishing. 2005. 50-61. 3. Xie H., Preast V. Xie’s Veterinary Acupuncture. Blackwell Publishing. 2007. 341-349.